Pink and Ivory Heishi Beaded Bracelet – Estimated Value $24? This bracelet features bold neon pink beads with contrasting ivory-colored beads and pale blue baby tassels! Pineapple Charm Bracelet – Estimated Value $15? This pale pink bracelet features a delicate little pineapple charm! The charm is gold with white and green enamel. More adorable charms! This bracelet features seed beads and a hot pink parrot charm with gold accents. 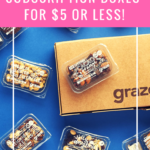 Verdict: I think this is a great subscription box and I love the price point and value. I love the designs this month, and the bright pink contrasting the pale colors is a lovely mix! Is it unusual to receive bracelet that’s totally different from what’s shown above? Last month was my first month, and it wasn’t what was reviewed for July. This month my club order is still unfulfilled, I’m hoping I can still receive these bracelets! They’re super cute! I heard the string bracelet is going to be very popular next year. As well as wearing lots, the more the better. I’ve been wearing up to 10 at a time, mixing up styles from my collection. This is one of my favorite subs! Not at all. I never had a problem. They are very nice and seems very organized. I heard bad things about people’s card info neither stolen through this sub? Does anyone know if that’s true! I’d like to get this for my daughter? Your daughter will love it. I vever had a problem. Customer service is very nice too. A Very nice company. I agree – their CS is excellent. Several months ago I had a bracelet set that said delivered but I never received it. USPS was having a lot of problems in my area at the time, so it was probably lost. I contacted PV fully expecting them to tell me, “too bad, so sad” about the lost order, but they sent out another set no questions asked. I was very grateful and impressed that they not only believed me but took the steps to correct something that wasn’t even their fault. I’ve only subbed about 5 months ago but no problems so far. I’ve also made lots of online purchases in the shop and never had any problems. In fact, they snuck in a free bracelet in my last shipment. Lol. Exactly how they treat me. It’s a nice surprise. I might have to resub. I’ve been subbed off and on since they started and I haven’t had any payment or customer service issues. It’s one of my favorite subs *because* it’s so low-maintenance.